Fabric bunched around her waist, obscuring whatever curve might have been hidden there. She had age marks that looked like chicken tracks across cement, austere cheekbones, a gaze that dove out every time she turned her head — landing, revealing something between judgment and waiting. Her lips stood alone, as if they had been rolled up and pinned, preserving a sensual vitality that betrayed itself only at the corners of her mouth where her creases dipped in exhaustion. She was the keeper of the home and a mother of two. From the way visitors overlooked her labors, the way her elephant-bodied husband bypassed her on the way to the kitchen, it was obvious that no one recognized how beautiful she was. 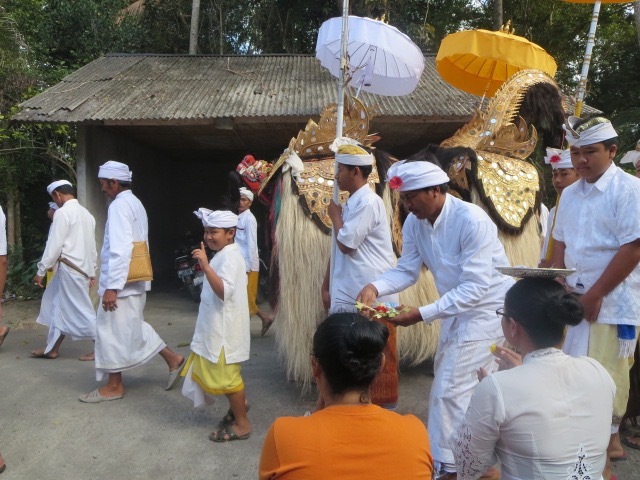 I had come here, to this small village in the center of Bali, to celebrate the festival of Galungan. Galungan was a Hindu festival in which young men and women took the places of departed souls; they lay open-mouthed under the hands of Hindu priests who tamed their inner demons by filing away at the bottoms of their teeth; and so children became adults, establishing holy unions through marriage, bridging families and shifting loyalties. Over the course of several days and on numerous occasions I rode side-saddled on Bu Ayu’s motorbike, propping baskets of food and flowers on my head, bowing into family compounds and offering congratulations to newlyweds who supplied pork in exchange for our blessings. My original intention was to inquire about Bali’s resident spirits, but in the end what I learned, quite accidentally, was that reality is what we leave behind. There used to be a beloved matriarch in the house. Bu Ketut, who had grown up in the family compound (but now lived with her children in Denpasar), told me of her mother, whose spirit sometimes slept beside her in her husband’s place, and whose voice followed her like a recording, singing. The “mother” she mourned was in fact her aunt, never married, an ordinary midwife. Word was that this woman’s selfless love was so effulgent that she made everyone feel they were borne of her own womb. There were stories of Her guiding lonely children through hospitals, tending new mothers, taking visitors on walks through rice fields and taking dips in the river, pushing mattresses together in the living room and laughing late into the night. Bu Ayu said that when this woman died the condolences came like a sea. Yet it seemed all she had to do was make time for people. And care. Now that I’m back in the United States and I’m bound to my computer, I feel a new reality creeping in, one I hope won’t permeate. It’s a reality that says I don’t have time for anything apart from finding a path, reaching a ladder and climbing it. At my first stage of reverse-culture shock, this has me scrambling in a void. So for sanity’s sake I retreat to the rice fields in the Balinese village where I stayed, where stairs of grass are laid out like a bowl, and beside it runs a stream where Shiva is known to bathe. Grandma — Bu Ayu’s mother-in-law, the only elder living in the compound — waits for me there. She looks as bird-like as ever, perched by the steps with a stern, pretty set of features and slightly bulging belly. Like a sculpted Madonna, her face allows no expression and lets out little speech. The scene unfolds as it did then. I look down at the stream and observe it flowing cleanly along its gutter of concrete. Step in. The water comes up almost to my waist. I lift up my nightgown so only my hem gets wet. Against the current of the stream my legs wobble like loose pegs and my torso stands exposed to the late-morning air. I’m cold. Down the river are children splashing in their underwear, older men soaping bare bodies. Sometimes they turn to look at me. Self-consciously I bring each leg to the surface to rub each thigh clean, trying to maintain a grip on my nightgown, which I clutch to my chest using a free arm. Grandma stands nearby, watching me. “Take off your clothes” she says firmly. At the moment I’m still fumbling with my wet cotton, and pause to look up. I want to tell her I’m plucked enough. “Take off your clothes,” she says again. The children nearby are still playing, and the villagers who just entered the clearing pause beside Grandma, letting their eyes linger on me. My body bleats like a sheet. A woman as old as Grandma moves off by herself and squats at a place by the riverside, removes her blouse in one motion, undoes her bra, and splashes water over a tumor that protrudes from her neck out to her chin. She motions at me to Grandma and says something in Balinese. The two old women laugh. I exit the water and walk to where Grandma stands. 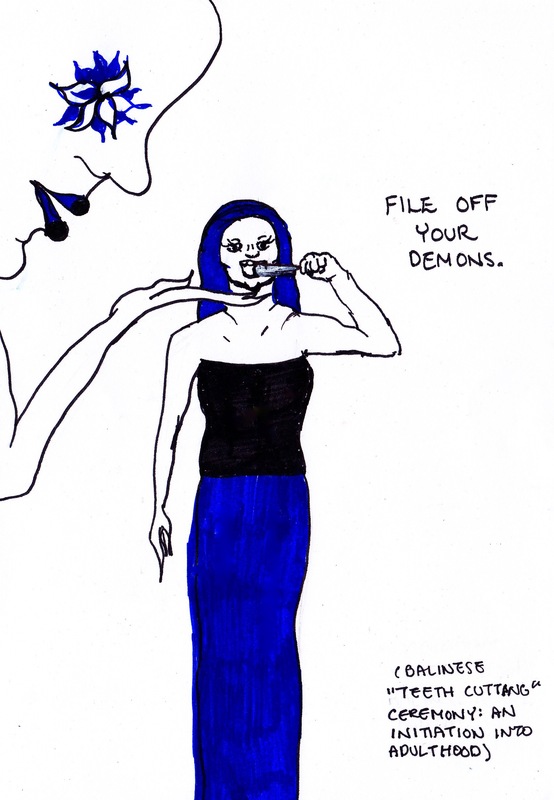 I remove my dress. Grandma takes it and drapes it over her crossed arms. Not a word, not a blink. “Thank you” I say and look down at my clothes, but I’m really referring to something else. Grandma observes me in my minimal underwear, waiting for me to hide myself, but I don’t. I feel my skin move beneath her eyes like parcels of a used temple offering. But then I see her blink and nod, and this is how she accepts me. Perhaps she recognizes her own youth in my shapes, or perhaps my act of self-exposure has suspended my origins so that, without grace but with humility, they could come to rest within her traditions. Now, I am neither here nor there. I am in the United States, sitting beside my mother at our kitchen table. I am half-way around the world, passing a dormant temple on the back of a little boy’s motorbike. I can teleport myself to where I’m haunted by the love of an immortal midwife, where I watch Bu Ayu inspect my grandmother’s locket, wrap her arms around her children and look out at nothing. I can try to establish a nest in a country that raised me, simultaneously cling to Indonesia, where I can reveal the most volatile part of myself to a strange old woman and no one looks away. or to be a citizen of anywhere. 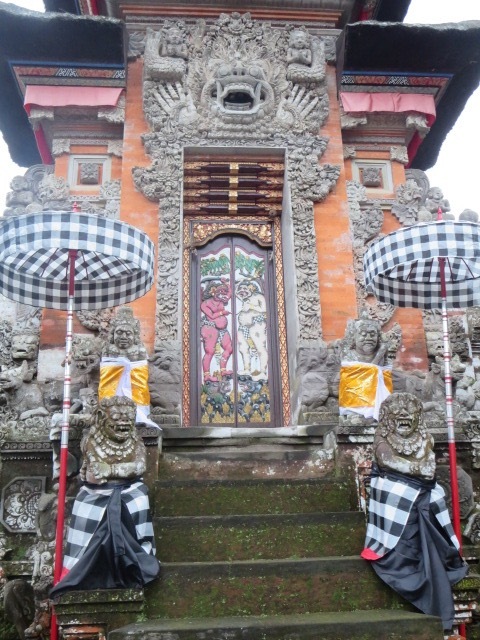 Gates of the local temple, Pura Dalem. The two figures on the door represent the polar forces of Hindu cosmology. 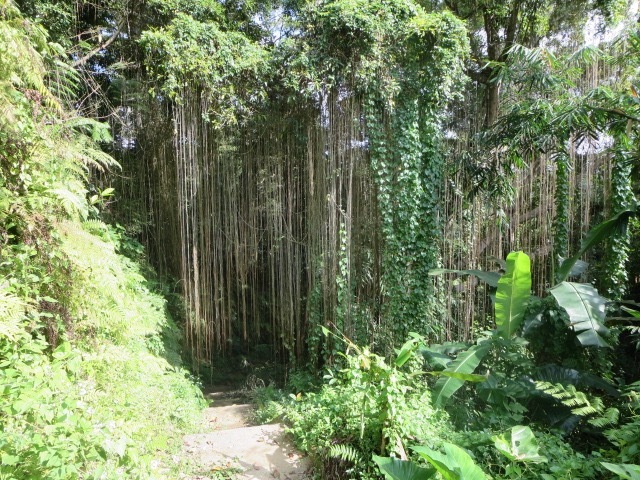 Shady route to the river, unused by locals because of its status as the path for the spirit of Shiva.